With Pollack being our main target through most summer month's averaging 3-15lb with larger on occasion, every so often a nice run of Cod will show up on some of the shallower wrecks with most fish being 3-6lb, You will also get the odd ling thrown in for that persevering angler. Caernarfon Bay (occasionally Caernarvon Bay) is an inlet of the Irish Sea defined by the Llŷn peninsula and Anglesey and there is some amazing fishing to be done in this region. With a vast amount of sand banks and reefs, Caernarfon bay is a superb all round days fishing with fairly settled tides and shallow water depths. 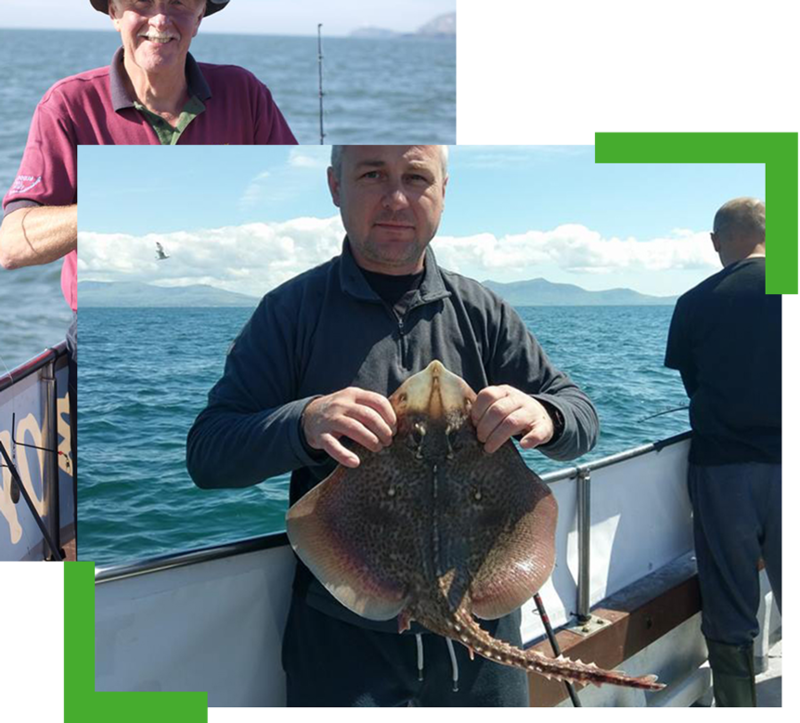 We tend to fish Caernarfon Bay on the spring tides with Skate predominately feeding on the ebb tides down to slack water. 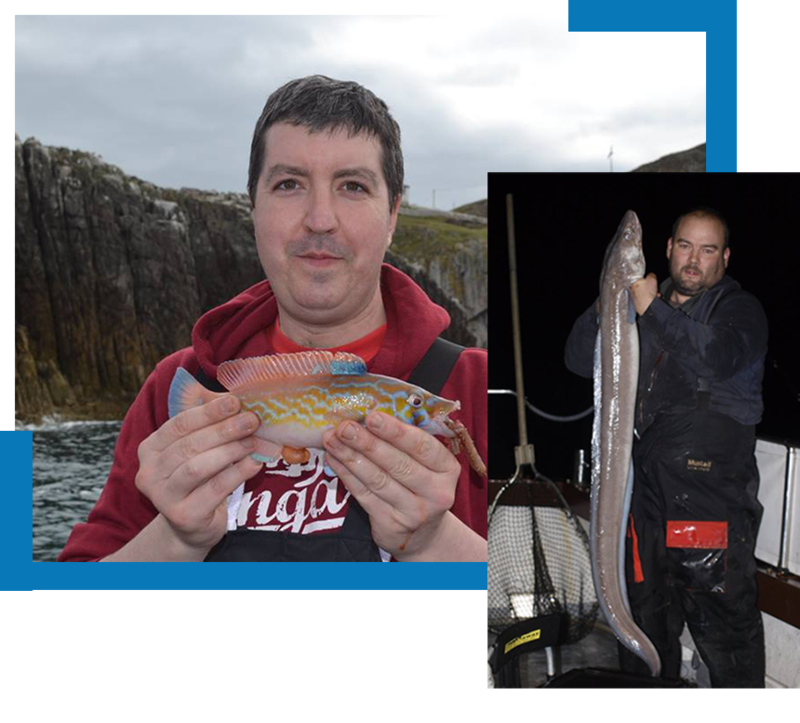 The bay can provide excellent sport on species hunting days drifting over the many banks in the area for Gurnards, Dabs, Turbot, Plaice, Skate ect.... A few wrecks around the area provide a great attraction around slack water to anchor up for Tope, Spurdogs, Skate and Bullhuss. 4-8oz uptider or 12lb class boat rod along with a 5000/sl20 size real loaded with 20lb braid for the main part and then the business end consists of a running ledger 4ft hook length of 30-60lb mono depending on your target fish and again a verity of hook sizes to accommodate multiple species. weights from 4oz to 12oz torpedo and teardrops work best. 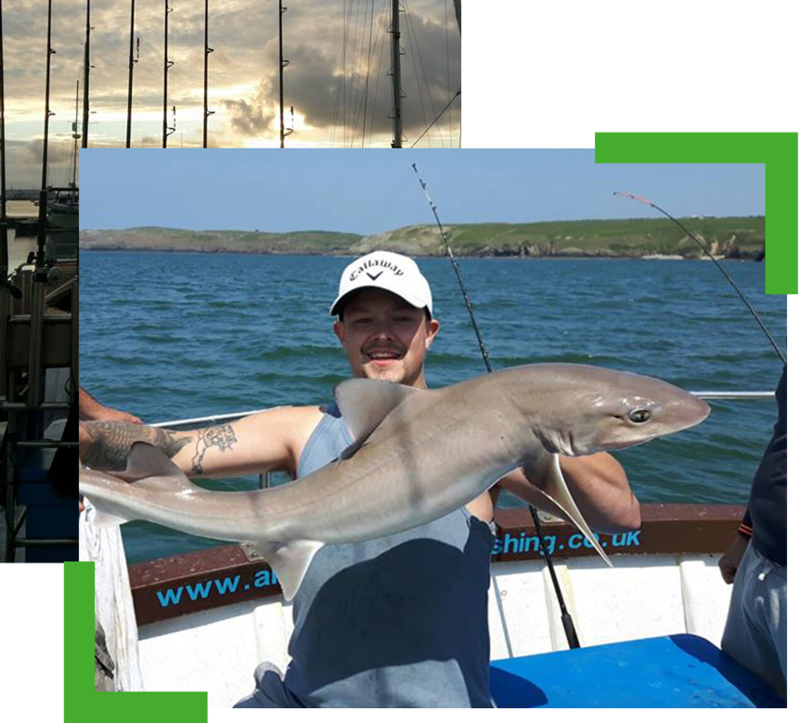 Get in touch with Bad Boyz for amazing fishing triups in and around Caernarfon Bay, Anglesey. 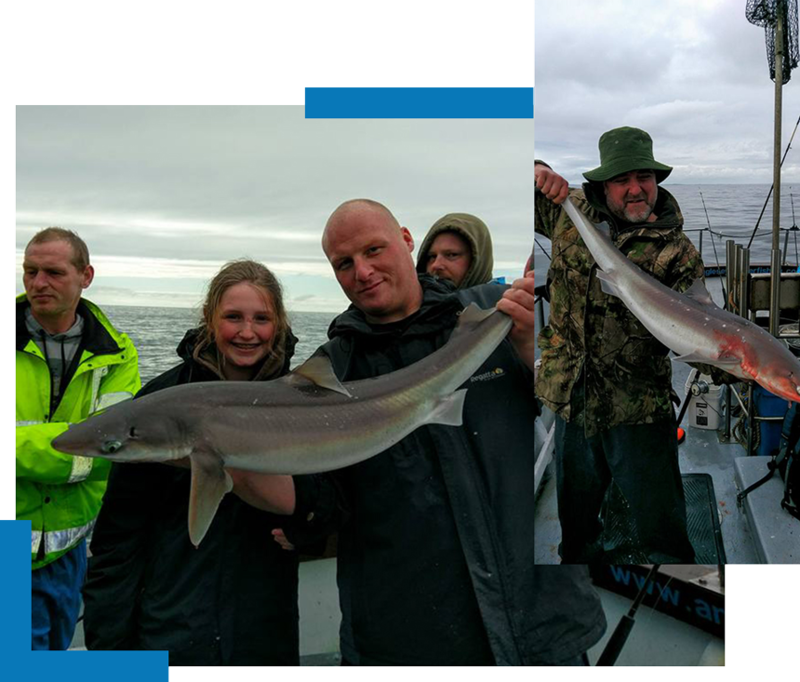 Tope to 72lb and Spurdogs to 21 1/2lb are the boats records although 80+lb tope do come from our coastline most seasons on neighbouring boats. The tope begin to show early may and continue to build in numbers through to mid October, along with great sport on tope there are plenty of smaller sharks in the form of Spurdog to be caught in the deep waters off our coastline providing excellent sport from as early on as March in large shoals running through the summer and can often be a luck of the draw whether you lift your rod into a tope or a spurdog. A slightly heavier uptider 6-10oz coupled with a 7000 / sl30 sized real loaded up with 25 to 30lb breaking strain mainline, braid being the best choice. Rigs are nice and simple, for general a running ledger with 3-5ft 200lb mono-filament hook length and a 6-8/0 bronze hook for quick rust away if the trace if lost in the fish, we steer clear on wire traces due to the damage it could possibly do to the fish. When the large shoals of spurodgs are around a heavy weight 2 hook paternoster made with 100/150lb mono and a couple of large red/lumi muppets will do the business for a quantity catch. 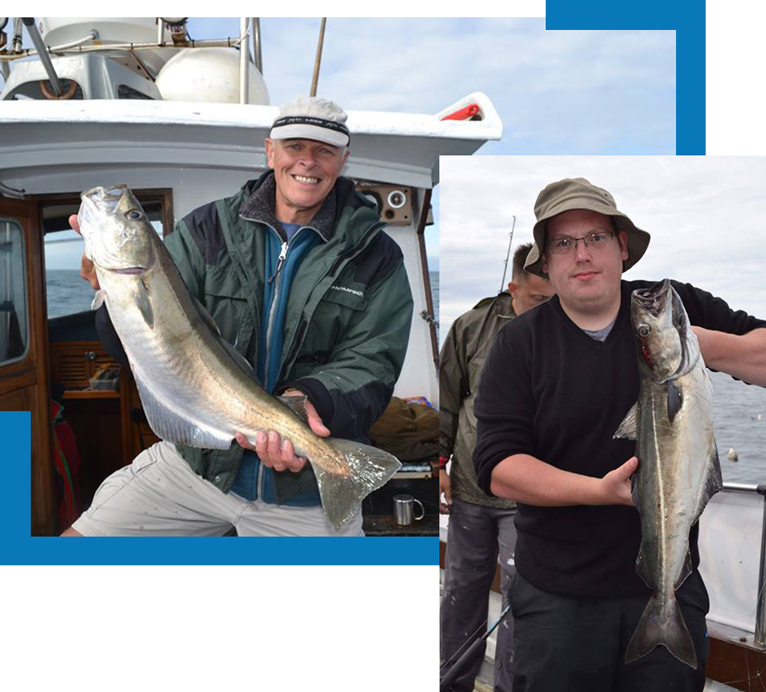 Every year multiple 20lb+ fish come to the boat showing the quality we have in our area. These hard fighting sharks are found in shallow water normally 60ft and below on slightly rough terrain where they will be hunting out food which consists of crabs,prawns and crustaceans. Smoothhound unlike most sharks don't have teeth, in there mouth you will find a tough 40 grade sandpaper like pad connected to extremely strong jaw muscles enabling them to brake through the toughest of crab shells. Bad Boyz Charter simple amazing fishing ! The River Mersey - new to Bad Boyz for 2017, from mid October through to mid march we will be working along side some fantastic skippers running in the Mersey fishing the winter Cod season. every year the Mersey produces a great stamp of cod ranging from 1-20lb along with great action on quality Rays, Dabs and Whitting. This will be Bad Boyz first winter season fishing from the Mersey although not Aaron's, Aaron has fished the Mersey for the last 12 years from competitions to skippering a friends day boat so he has gained great fishing knowledge of the area which will only grow with seasons running the boat from there on a daily basis.